Today is the 150th birthday of the Philippines' National Hero, Jose Rizal. 40% of my readership won't need an introduction to this man, but for the other 60%, you just need to know that Rizal was a polymath and a hero. He was a doctor, a poet, a linguist, a sculptor, a translator, and most importantly, a reformist. He was rather small and frail, and so he fought with his novels and his words, and was so instrumental in getting Filipinos to demand independence from Spain that he was imprisoned and shot because of it. 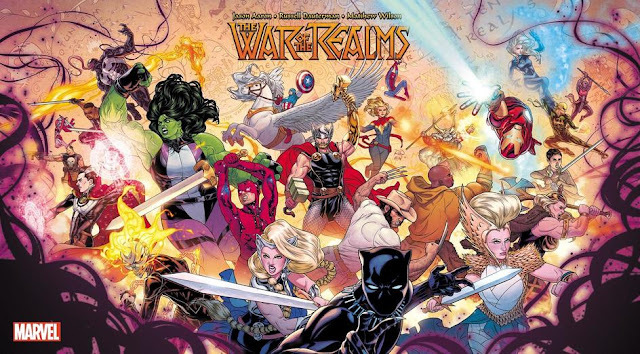 But for the purposes of this post, because this is The Comics Cube! (or today, Ang Kahong Komiks), we're going to talk about Jose Rizal, the komikero. 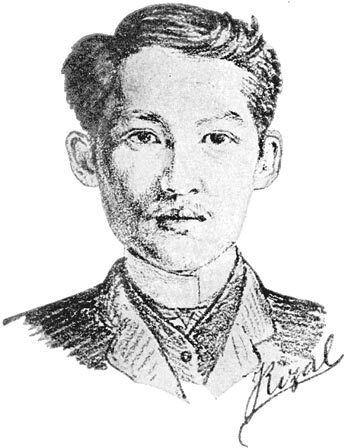 In 1884, Jose Rizal was asked by Trubner's Record, a magazine about Eastern Literature, to contribute a couple of fables. Rizal happily obliged, turning in "Ang Matsing at ang Pagong," which means "The Monkey and the Turtle." Or is it tortoise? I dunno; I can never tell the difference between the two. 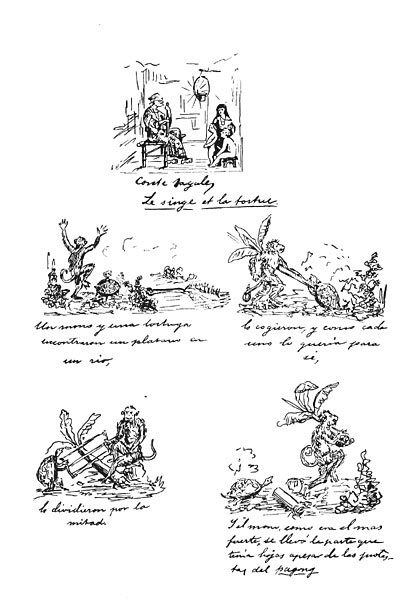 Rizal didn't put speech balloons in the "panels," rather putting the narration and the dialogue underneath the pictures, but much like Rudolphe Topffer's MR. OBADIAH OLDBUCK, the story is very much dependent on both words and pictures, mostly evident in panel 1 of page 6. The tortoise and the monkey came upon a well-grown banana plant. Both wanted to have the plant to himself. "Wait a minute," the monkey said. "Let’s be fair. Let’s divide the plant into two, and then assign halves for the both of us." "Yes, that’s fair," the tortoise said at once. "And since I thought of it, I get to choose which half shall be mine!" the monkey declared, and immediately he set to work cutting the banana plant. He kept the top part, the part which was golden with fruit, and left the ugly stump to the tortoise. The tortoise did not complain. He only went up to the monkey and said "We’re good friends. Will you let me have some of your fruit?" "No!" the monkey snapped. "We’d agreed to stick to our halves of the plant. I get to keep whatever comes of my half and you get to keep whatever comes of yours." After finishing off all the bananas, the monkey planted the top part of the plant with the hope of growing some more fruit. The tortoise did not have to do anything with his half of the plant at all, as it was still rooted to the ground as a stump. But the top part of the banana plant could not grow roots, and thus it shriveled up and died. 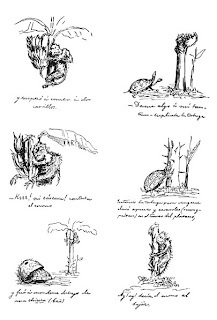 The tortoise’s stump, on the other hand, grew to be another beautiful banana plant, and soon enough it made the monkey drool by having twice as many bananas as he had been able to extract from what had been his half. The tortoise would not let the monkey come anywhere near his full-grown banana plant. "We’d agreed to stick to our halves of the plant," he said wryly. The monkey went home and plotted. The monkey decided to sneak into the tortoise’s yard one night and steal the bananas straight from the plant. But the tortoise had been prepared for such a breach of friendship. 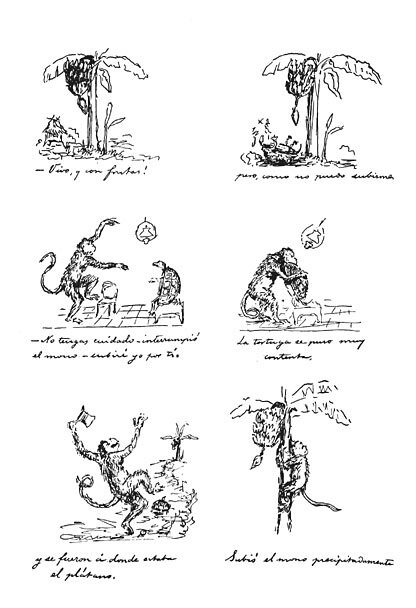 He waited until the monkey had climbed too high up to be aware of anything going on at the ground, and then he laid sharp pebbles all around the roots of the plant. 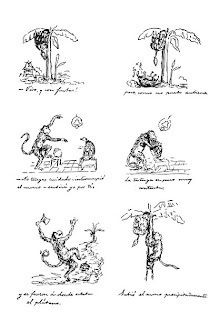 It was so that the monkey jumped down from the plant after having eaten as many bananas as he could, and was stung in so many places all at once! The monkey was furious. He hunted all around for the tortoise. And when he did find the tortoise, he grabbed the slow-paced creature by the shell so that it could not get away, and said at once that he would be killed. "But, as we had been good friends, I will let you choose," said the monkey. "I am thinking of grinding you and your difficult shell in a mortar and scattering your ashes. I am also thinking of throwing you into the sea. In which manner would you like to die?" "Grind me to ashes," cried the tortoise, "for I cannot bear the touch of saltwater!" "Aha! So you hate saltwater!" The monkey raced off down to the seashore and flung the screaming, flailing tortoise into the water, as far away as his strong arms could manage. 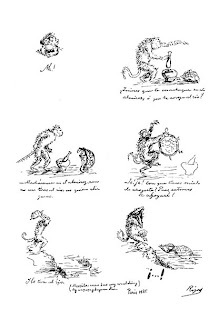 "Good riddance," the monkey said, thinking that he had dealt the tortoise the ultimate revenge for spiting his cleverness. But then, just as the monkey was leaving the shore, he heard familiar laughter drifting in the sea-breeze. He turned around and saw the tortoise only too near the shore, chuckling merrily. "I’d fooled you, monkey!" he was shouting. "The sea is the tortoise’s home!" 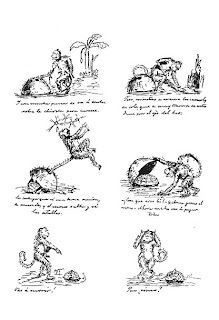 The monkey gave a howl of rage and bounded back to where the sand met the surf, but the tortoise had already gone back, still laughing, into the ocean’s heart. 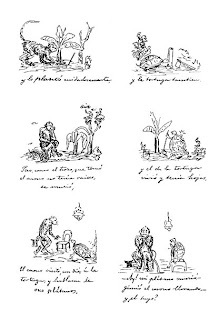 "Ang Matsing at ang Pagong" is believed to be the first time words and pictures were merged to tell a concrete story, and so Rizal is considered as the first ever komikero, paving the way for people like Mars Ravelo, Nestor Redondo, Pol Medina, Alfredo Alcala, Jess Jodloman, Gerry Alanguilan, Philip Tan, Francis Manapul, Ace Enriquez, and many more. Learn more about Jose Rizal here and his komiks here. Rizal is surprisingly popular outside of the philippines. There's a Rizal community in Singapore, for example. I'm not sure, but i think there's also an international rizal community as well. Excellent read! This was one of my favorite stories as a child. It was nice to see it in its original, albeit indecipherable form. Uh, so is the character a tortoise or a turtle? The character was a tortoise, as stated; Rizal just made the mistake of saying its home was the sea, when in fact its preferred habitat was land (its best friend was a monkey who didn't even know it could swim).